Every time I go to the First Glass wine tastings and taste a riesling that is just off dry with juicy acidity and fruity freshness I say to myself, ‘I am really enjoying this, I should open more rieslings at home.’ So when I went to my sisters for dinner over Queens Birthday Weekend the Main Divide Waipara Valley Riesling 2014 was one of the wines in my wine bag. 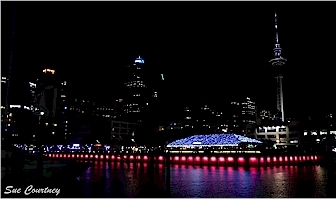 We opened it after a pre-dinner excursion to Viaduct Harbour to see the light installation that switched on at 6 pm. There was a slow cook dinner in the oven to finish off while we were out. Back at home a pre-dinner drink seemed like it would hit the spot but because dinner was almost ready nobody wanted nibbles. Main Divide Waipara Valley Riesling 2014 turned out to be an excellent choice because it is the perfect ‘beverage wine’, that is a wine that doesn’t need food to enjoy a glass of before dinner, which makes it an ideal after-work drink too. A satisfying quaffer if you like. It is a light glossy gold in the glass with fresh mango and tropical fruit aromas and juicy, refreshing, bright tangy flavours with sherbet-like tingles dancing across the tongue – like the fizzy sherbet lollies I loved when I was young – together with bright apple / lemon / lime / grapefruit acidity balanced by honeysuckle-like nectar. And then honey becomes a prominent feature. A honeycomb-like honey and then another childhood memory of candied fruit jellies (that if I was lucky I would get for a Xmas present) pops in. A delicious juicy fruity wine with a racy acid spine. One delicious glass before dinner is all you need to prep your palate for the meal ahead. It’s off dry to medium in style with 12.5% alcohol by volume and RRP $20.99. This entry was posted in #nzwine, canterbury, North Canterbury, riesling, Waipara Valley and tagged 2014, main divide by Sue Courtney. Bookmark the permalink.